Much has been said in 2019 about the Pancake Pillow. So we have decided to write a review on it because it can be difficult to tell how pillows really feel until you read customer reviews. This article is an amalgam of customer reviews for the Pancake Pillow. But before we begin with our synopsis, we will first explain the features of this pillow. What Is The Pancake Pillow? The main appeal of this pillow is the fact that, as the name suggests, it contains several layers of pillow in one. It comes with a gusseted cotton pillow cover that can hold all 6 of the ‘pillow pancakes’ that come with this product. The pillow pancakes are made of down alternative. This is basically synthetic fabric that is potentially made to feel as soft as down. This fabric is made of polyester. The advantage to this layered design is that you get to choose the exact thickness of your pillow. 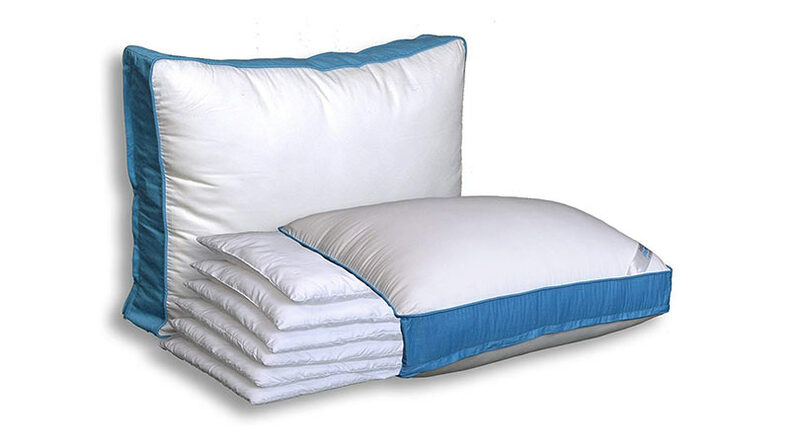 You no longer will need to purchase a pillow only to find out that it is either too thin or too thick. Those who have neck pain or arthritis can find this especially cumbersome. Here, we will go over the pros and cons of this pillow. This way, you can see if this is something you want to purchase. The pros and cons below are based on customer reviews. The company recently starting selling extra pillow covers. This way, you can create more than 1 pillow out of the ‘pancakes’. We will link to the extra pillows below. Since this is a down alternative, it does not have the same cooling properties as down. Down alternatives are not quite as durable as real down. The pillow layers break down a bit over time. The pillow layers have been said to be a bit too soft and fluffy. Customers have noted that the pillow gets warm when being slept on. This can be good during the Winter, but not so much for the Summer. The down alternative tend to shift, making way for your head being a bit too close to the bed beneath it. A couple of years ago, customers had been asking about getting a hold of extra covers in order to be able to create other pillows out of the layers. After all, it would be a waste to remove some of the layers and never use them. Some people use the extra layers to put them on their sinking couches. Others give them to others who may have a different sleeping pattern. Perhaps the best place to get a Pancake Pillow is on Amazon. Amazon’s return policy (not saying you will need it) is top notch. Get the Pancake Pillow on Amazon. This is a unique pillow that can dramatically cut down on the time you spend testing various other pillows to find just the right one. If you have neck pain, or you sleep in various ways and need variability in thickness, this pillow could be for you. Because this pillow comes with a satisfaction guarantee, you can’t go wrong with trying it out.